Mix marinate ingredients together in a bowl, marinate the shelled prawns one by one and set aside for 15 to 20 minutes. Lightly grease the pan with some cooking oil and heat it up for 1 minute on medium heat before frying the marinated prawn. Remove the prawns and drain on paper towels. Use the remaining oil in the pan to lightly saute the chopped garlic, ginger, onions and carrots. Add in salt, pepper and sugar to taste. Turn down the heat and add in the prawns, spring onion leaves and peanuts. Lighly toss them for 1 minute. Remove and serve warm with rice. 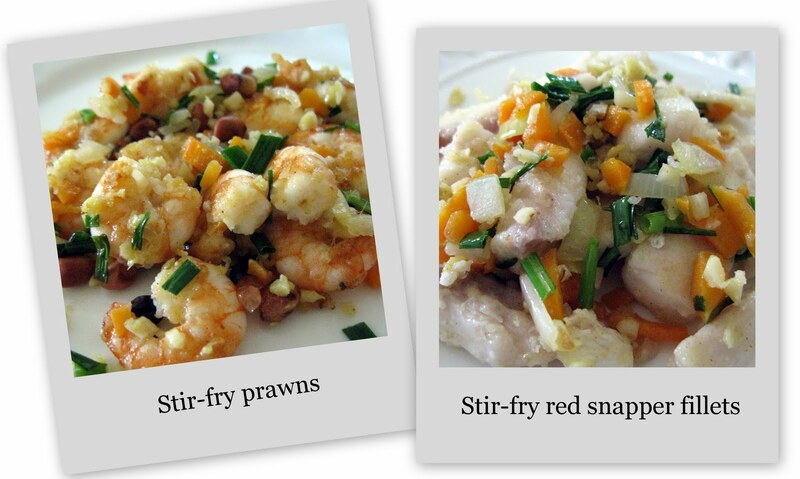 Note: You may replace the prawns with fish fillets (preferable white fish). Repeat step 1 to 5 but do not overcook the fish fillets. Caution: Eat at your own risk.